The use of a mix of distributions, each optimised for a specific task, ensures all relevant target areas are correctly lit with minimum waste light and maximum efficiency. The chosen luminaires use light sources with a high efficacy. Combined with precision optics and the use of various baffles to eliminate waste/upward light, this provides a high system efficacy. The creation of four pitch lighting modes (1000 lux to 2000 lux) allows the correct light level to be set. This reduces light levels and therefore energy consumption for a significant proportion of time. 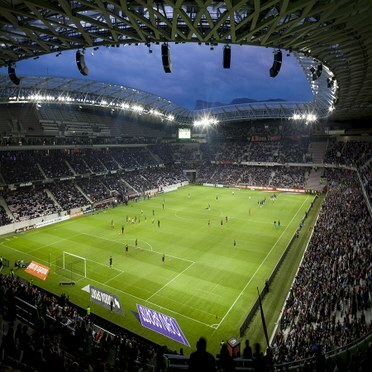 Opened in September 2013, the Allianz Riviera in Nice, France, represents the next generation of stadia. With a 35,000-seat capacity, it will host several matches in the UEFA Euro 2016 finals. It also boasts an extensive and varied programme of sporting and cultural events, concerts and shows, as well as being home to the national sports museum. 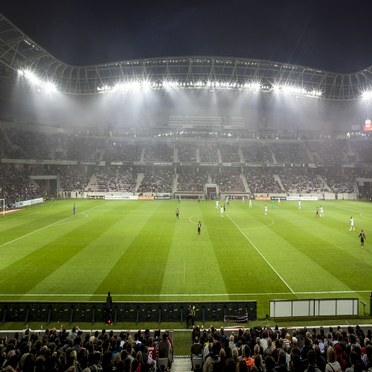 VINCI, a returning customer and leading player in building and operating the hosting Euro 2016 stadia, approached Thorn with a requirement to provide Allianz Riviera's pitch and exterior sports and area lighting. 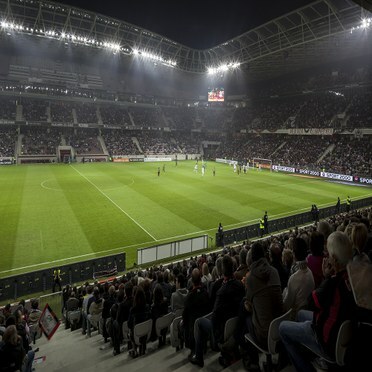 Virginie Ameingual, Technical sales at Thorn Lighting explains: "The project was won on the basis of VINCI's confidence in Thorn's extensive stadium lighting experience. In particular, Thorn was able to reassure VINCI that it would achieve the stringent photometric results requested by FIFA for horizontal and vertical lighting." Thorn's Mundial and Areaflood luminaires were selected for the stadium's floodlighting, with Mundial being used for the pitch and Areaflood for the exterior concourse. Mundial is a high power, high performance floodlight specifically designed for sporting applications. For this application, various precision optics have been used to achieve uniformity and combined with baffles to eliminate glare and upward light spill. Areaflood is a reliable, general purpose area floodlight with superior optical performance and light control. Its accurate optical system with integrated visor effectively controls obtrusive light (0 cd at 90°). This sports lighting scheme benefits from task/scene setting to allow the stadium to set one of four pitch lighting modes. 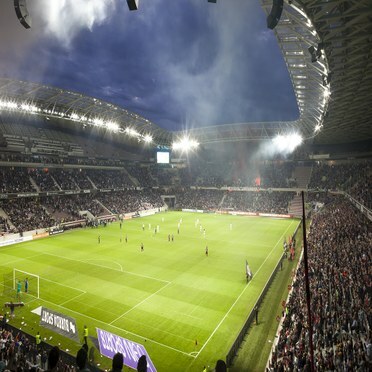 Mode 1 lights the pitch to 2000 lux, meeting the Euro 2016 requirements. Mode 2 lights the pitch to 1600 lux, meeting national and first league requirements. Finally, mode 3 and 4 light the pitch to 1400 lux and 1000 lux respectively. These modes allow lower levels of lighting to be set as permitted. As well as ensuring the correct light level is used, the various modes allow energy consumption to be minimised when possible. Sales Director Mediterranean Region Jean-Luc Allemand explains "We are very pleased to have participated in the lighting for this prestigious achievement. This is the result of close collaboration between Vinci and Thorn, from the design to the implementation."